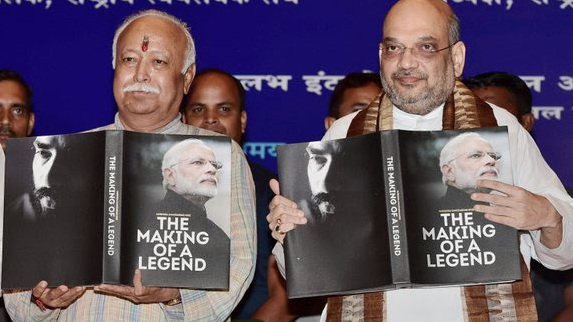 Making of a Legend: Helped by the RSS. In the face of an increasingly hostile Rahul Gandhi, the RSS continues to bank on Prime Minister Narendra Modi as the pivot to stay in power for the next five years. With Modi remaining BJP's single biggest vote catcher, it is an unequivocal thumbs-up for him from the Sangh. From ‘Prantcharaks’ to ‘Zilla Karwas’, they are coordinating with local units of the Bharatiya Janata Party for door-to-door campaigning. Bringing the voter to the poll booth is the simple strategy as the BJP ‘karyakartas’ and the RSS foot soldiers work in tandem. Pollsters and pundits are already predicting that the BJP will fall short of a simple majority on its own and despite the ratcheting up of the volume on the convergence between hyper-nationalism over national security and Hindu machismo, the BJP has over-promised and under delivered. As such, they have moved all their muscle and firepower behind Modi and the BJP. In that, it is a seminal election where the Sangh doesn’t want any unnecessary problems. For instance, the Northeast is run by Ajay Jamwal, Sunil Bansal who is Sangathan Mantri for Uttar Pradesh or Nagendra Nath, who is General Secretary Organisation BJP for Bihar. With direct access to the cadre, his organisation skills are legendary, once a personal assistant to the then RSS general secretary H.V. Sheshadri in the 1990s, Sharma is the man for all seasons in the grand Hindu coalition called the Sangh. Of the ‘Kshetri’ satraps, Alokji or Alok Kumar, who now handles Uttar Pradesh and Uttarakhand, is a key player.